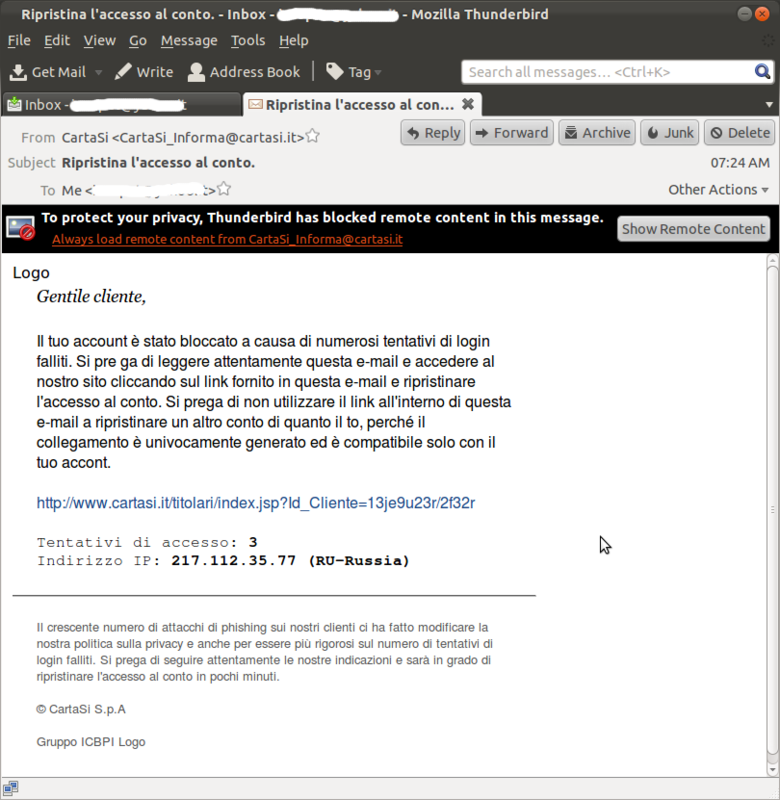 I receive phishing attempts in my mailbox nearly on a daily basis. All of them are so naives that they gain the trashcan in a matter of seconds, but today I've got one that left me thinking for a while. This one actually refers to a credit card that I actually own: maybe there was a breach in an e-commerce site where I bought something in the past. 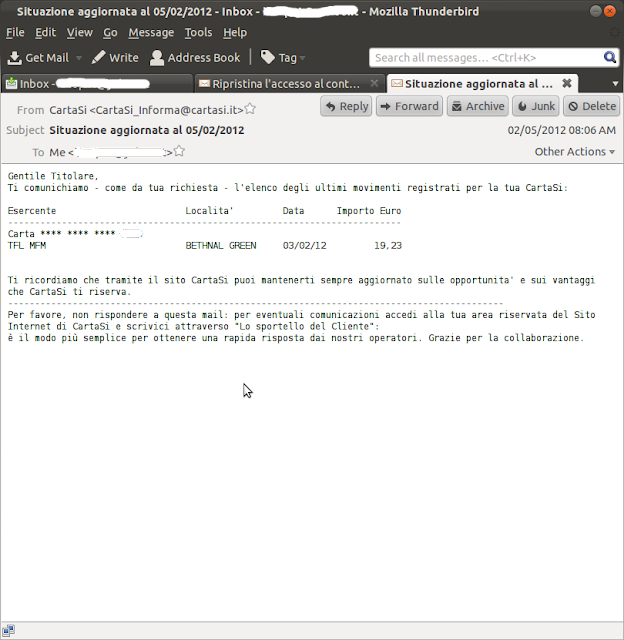 The from: field contains the actual sender of a legitimate CartaSI mail. Logos (not shown here) are actually linked from the real CartaSI site. The email text is nicely formatted and contains nearly no spelling errors. 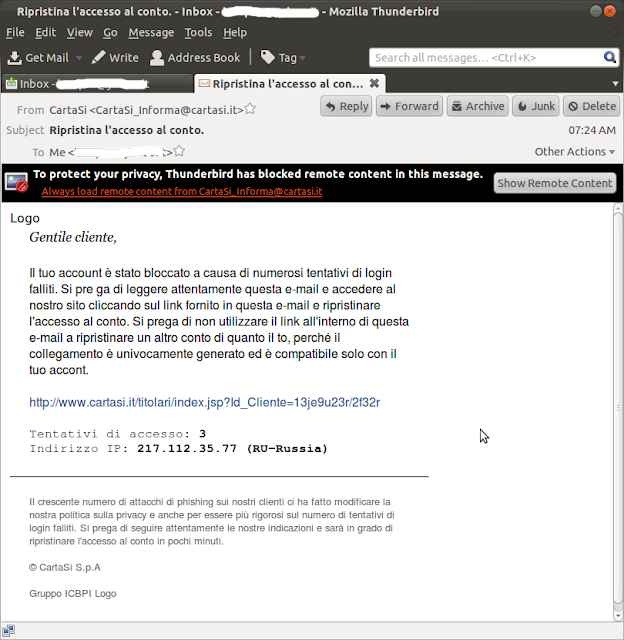 using a .lt domain to send .it emails may be accidental genius: on some fonts, lt looks very similar to It. the from field seems to prove the authenticity of the email. Subject: Ripristina l'accesso al conto. The email text is hidden inside comment fields, probably to hide it from antispam filters. But this one finally breaks the spell for good: the link is clearly not from CartaSI. There's even an insult to them (cartasi -> loosers). Just for comparison, I looked at a real, legit email from the same source: ironically the text is worse looking than the fake one. It seems to be generated by some legacy accounting system. sulle opportunita' e sui vantaggi che CartaSi ti riserva. atori. Grazie per la collaborazione.